Visionary artmaking, whether it is writing, visual art, dance or music, is a shamanic process, and many artists have enhanced powers of seeing, hearing, and dreaming that allow them to move easily between the worlds, without experiencing boundaries that keep others from exploring those realms. The artist often takes this journey for self-exploration, but the images, movement, songs and poems that result are transformative, enlightening, healing and empowering to those who experience the visionary artists work. Katelyn creates soul portraits from this shamanic space and captures the images for her client into a healing mandala. 100's of people have been able to tap into their higher wisdom using Soul Portrait Mandalas created by Visionary Artist, Katelyn Mariah. Order a Soul Portrait Mandala and find out what you soul would like to tell you. ​​Do you feel stuck in a job, a relationship or in your health? Do you feel disconnected from your inner wisdom? Do you question yourself and your decisions? Would you like to find answers to a pressing question? The Soul Portrait Mandalas act as a doorway, creating it's own energy grid, giving you greater access to your higher dimensional self and the answers within. Soul Portrait Mandalas are an avenue to connect you to your true spirit, beauty and divine nature. Soul Portrait Mandalas are a meditation piece that keeps providing new information as you view it. Created through a connection with your guides and Katelyn's guides makes it unique to you. Your soul speaks to you with the language of the heart in forms, feelings, colors and shapes to expand your consciousness through the image. Portraits are designed by your soul to stimulate and awaken unconscious wisdom that will help you decide what is the best direction to take. Each portrait is a beautiful, original water color painting that has a personal message for you. 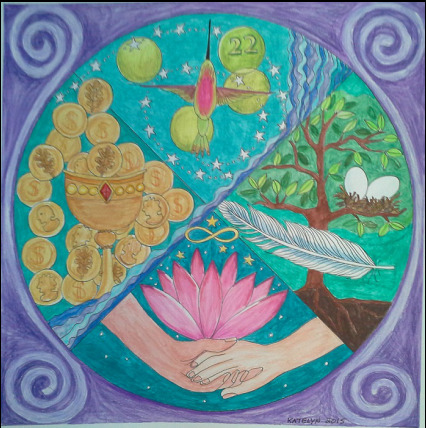 These healing portraits are done in the traditional Jungian Mandala style within the circle on a square format. Mandalas are a graphical representation of the center/self. The mandala is a template for the mind, a state of peace and order, a resolution of the chaos within and is the archetype for wholeness. By meditating on the image that Katelyn creates you can connect with your center of wholeness. You can purchase a Soul Mandala alone to use as a mediation piece or with a 4-5 page written reading that includes intuitive guidance and extensive discussion of symbol, color and numerology if that applies. YES! I would love to get a message from my soul!